The Scherzer situation is getting a little out of control. He's given up 21 runs in his last 13 innings. His WHIP over that three-game span is 2.08, with only seven strikeouts for a guy drafted specifically for strikeouts. On the season he's now 1-3. Now these three awful games game after four very good games, but the downward trend is concerning. His 6.08 K/9 is two-thirds of his K-rate in 2009. 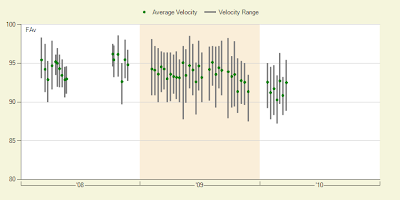 His average fastball velocity is down from 94.2 in 2008 to 91.8 currently. This is discouraging. I can only hope that he's working through some mechanics issues, since Scherzer's offspeed stuff (which has also dropped in velocity) isn't that great. Or maybe he just doesn't have the same stuff he had in the minors and in 2008. Or maybe he, like Santana and Lackey, had the misfortune of being drafted onto the Carl's Bad Caverns roster, which apparently immediately causes a 3 mph drop in fastball speeds. Jason Vargas: He pitches for the Mariners, who are terrible and won't give him consistent run support. He was also awful last year, due in part to his 86 mph fastball and the ease with which it bounces off bat-shaped pieces of wood and sails into the scattered remains of a Seattle home crowd. There's absolutely no way he's maintaining his current ratios. Batters are only hitting .203 against him. That's going to change when he stops pitching against Baltimore and Los-Angeles-of-Anaheim. Mike Leake: I'm not sold on this Reds resurgence. They've gotten three really strong performances in a row, from Arroyo, Cueto, and Bailey, but I've commented earlier on how spotty the run support is in Cincinnati. While he has five quality starts in his six appearances, they all involved awful opponents like the Astros, Cubs, and Mets. He gave up five runs to the Dodgers, and I don't want to own him blindly before I see if he can hold up against the Phillies, Brewers, Rockies, Marlins, etc. I just need to see more, and nobody else in the league seems to be in a rush to stash him away. His ratios are decent, but not overwhelming, and I'm looking for somebody that can replace SP3 numbers for a full season. Tom Gorzelanny: Here are Tom's ERAs from the past four major league seasons: 3.79, 3.88, 6.66, 5.55. His career K/9 is 6.46, but this season he's up to 9.26. You know why? Because he's played his games against strikeout-heavy teams. Reds twice (7th in the league), Arizona (1st), Mets (12th). He's also played against the Nats and the Astros. No wonder he's 3-0. If he can credit his success to doubling the frequency with which he throws his slider, then great, but I want to see him do it against...the Phillies, Brewers, Rockies, Marlins, etc. I'm not buying early on NL Central vultures unless your name starts with Jaime. Kris Medlen: I'm interested in his career 9.13 K/9, and I think the Braves offense will improve, but I don't have any guarantees that he can actually get through five innings every start. 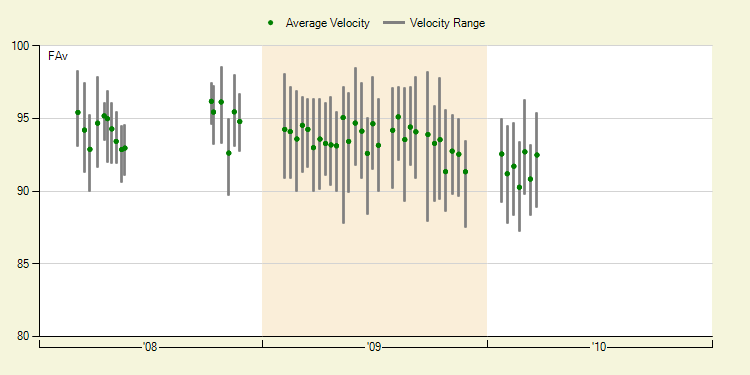 He had endurance problems last year, and he only went 4.1 innings against the Phillies in his lone start this year. Also, he doesn't exactly have much job security. Jurrjens will come back eventually, and the Braves seem committed to Kawakami. Perhaps in 2011 when he's had time to build up his arm strength, but I don't want to take risks on a pitcher that I'm not convinced will even qualify for wins on a regular basis. So why Derek Holland, who was torched last year (6.12 ERA), pitches in the AL, and only one 2010 start to his name? I guess it was just upside. In 38 PCL innings in the minors this year he had a 0.93 ERA, 1.01 WHIP, 8.6 K/9, 4-1 record, and only 1.6 BB/9. These are essentially identical numbers to what Medlen and Tommy Hanson were doing in the minors last year. He has a year of major league seasoning under his belt (like Scherzer did), plays for a team that should give him plenty of runs (like Scherzer), throws a fastball at 92 mph (Scherzer) 70% of the time (Scherzer), so I'm gambling with house money. If it works out and Holland comes out of the gate throwing flames like Colby Lewis and CJ Wilson then awesome, but if he stumbles again, it's like Scherzer's still starting, and then I can pick up the next best guess all the way until Chapman starts killing my ratios. In other words, I feel like I'm in enough of a pitching hole that I need to win the lottery, instead of doing the rational thing with a low-risk NL guy who's been consistent all year.